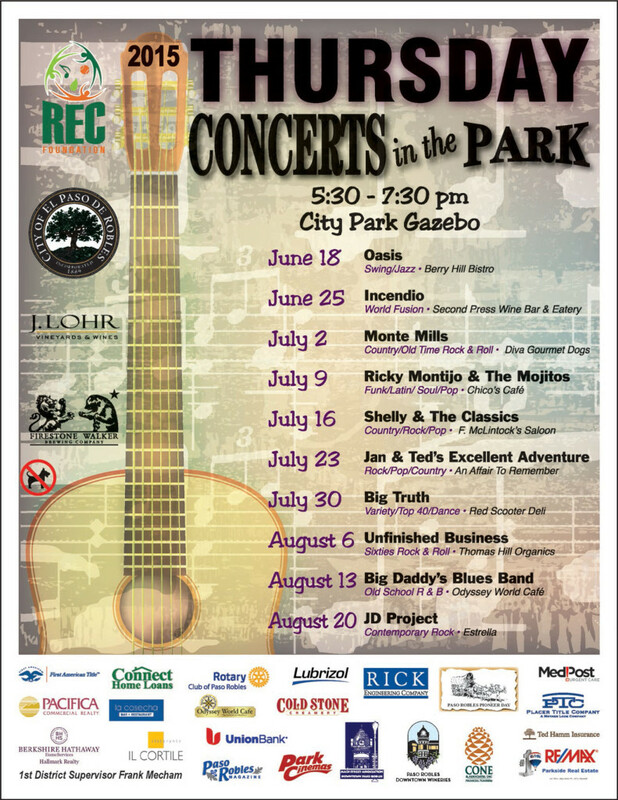 Today begins Concerts in the Park for Paso Robles! Every Thursday, during the summer, from 5:30-7:30pm join locals for a free concert featuring local music in the Downtown City Park…bring the kids, pack a picnic, and stop by for some wine along the way! On your way to the park, stop in for our Thursday Sip as we feature by the glass specials from $5 P.O. Box 1 wines and $10 Reserve. Also, we’ll have chilled bottles of our delicious white blend, the 2013 Silken Blanc at 15% off ($25.50). Just mention Concerts in the Park! And a tip for your sip is that you can enjoy the Thursday music from our patio as next week we’ll be extending to summer hours. Concerts in the Park in Downtown Paso! Starting June 18th join Downtown Paso Robles for live music in the beautiful park with the Rec Foundation! Variety of talent to enjoy all summer long and the beat doesn’t stop till August 21st! Music starts at 5:30pm!